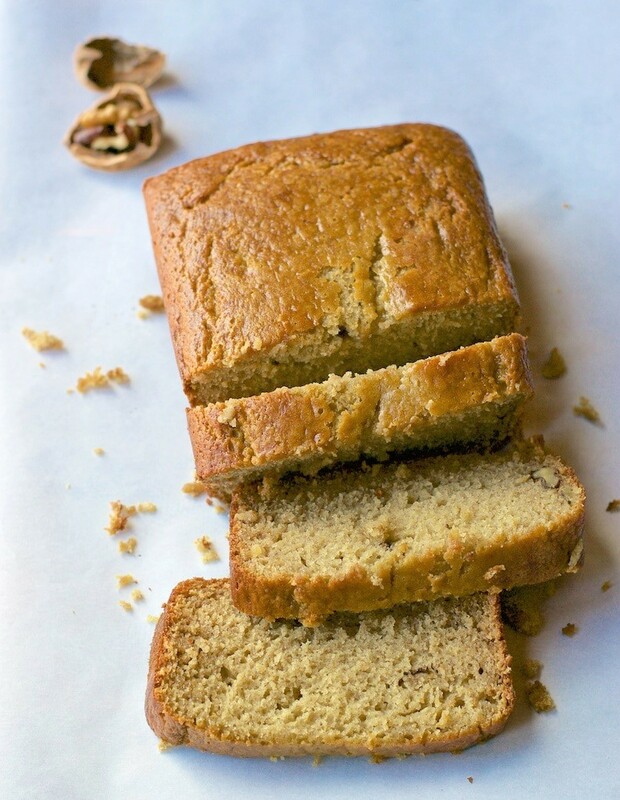 A quick and easy way to make healthy and moist Banana bread that you can whip up using your blender in no time! After much deliberation, I caved and bought a Blendtec Total Blender a month ago. I already have a Kitchen-aid food processor, Indian Mixie or a grinder and a wet grinder for Idlis. While they are all over 8-10 years old, I wondered if I really needed one more kitchen appliance. I did a lot of research – read reviews, saw tons of youtube demos, and asked around and decided that it was worth a shot since the blender was not only great for smoothies but you could make ice-creams, soups, dips, juice, batters etc. That meant I could tuck away all these other appliances I had and have it replaced by one! That sounded like a great idea and that’s how Blendtec entered our lives and ever since it has become a go-to appliance for all my grinding and blending needs. What I love about it is that it has considerably reduced the prep time be it for Idli batters or the healthy and moist Banana Bread recipe that has been shared here. 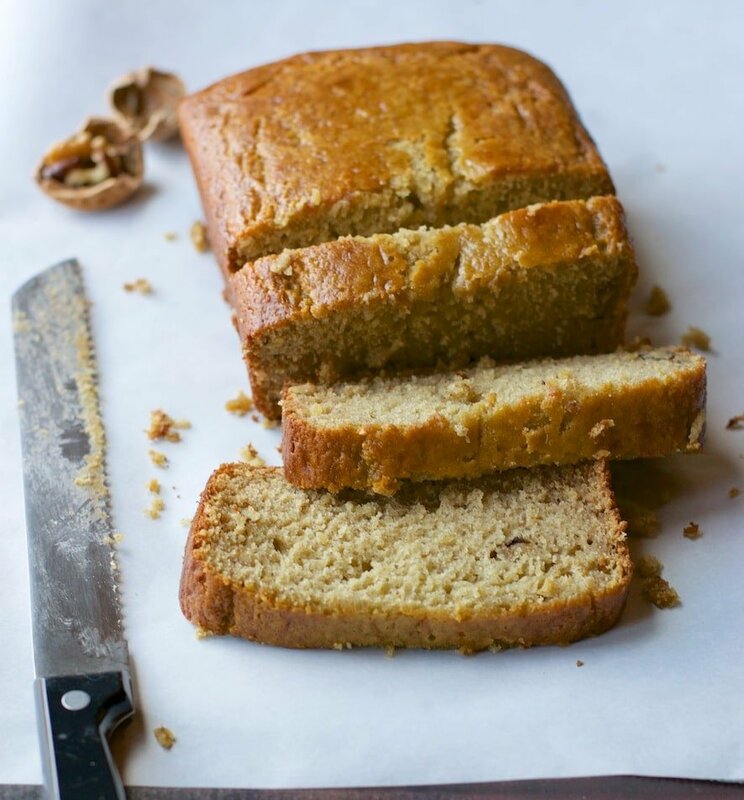 I already have a Banana Bread recipe that my family loves but when I browsed through the Blendtec recipe book, I found this recipe which replaced butter with coconut oil and I was immediately hooked and wanted to give it a shot. I made small tweaks to the recipe such as replace part of whole purpose flour with whole wheat flour and replaced vanilla yogurt with plain yogurt but for the most part, followed the same procedure. 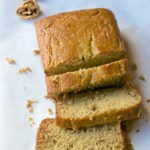 I wasn’t sure what to expect but little did I expect to eat the best banana bread I ever had! It was soft, moist and most importantly healthy with the goodness of coconut oil (that is my south Indian genes speaking – any dish with coconut oil is gold for me :)). My kids loved it and they would have probably finished the whole loaf if I hadn’t gently reminded them that they need to save some space in their tummy for lunch. While you don’t necessarily need a blender to make this recipe, using one reduces the prep time considerably! Mix all the dry ingredients - both flours, sugar, walnuts, baking soda, and salt till they are combined. Set aside. In a mixing bowl, add the mashed bananas, coconut oil, yogurt, vanilla extract, and egg and mix them well. Add the flour mixture and mix them in till they are combined. Add the remaining ingredients - both flours, baking soda and salt in the blender and secure lid. Press "Pulse" 3–5 times or until dry ingredients are combined with the wet. Add walnuts (if using) to the mixture and press "Pulse" 2-3 times to combine. Remove from the oven and let the bread cool in the pan for a few minutes before transferring it to a wire rack to cool completely. Grease a 6-inch bundt cake pan and pour the batter into the greased pan. Cover it with foil. Add a cup of water in the steel insert of the Instant Pot. Place the trivet. Create a foil sling and place it on the trivet. Place the bundt pan and close the lid. Adjust the pressure setting to high and the time to 40 minutes. Once the cooking is done, wait for 10 minutes before releasing pressure. Carefully remove the bundt pan from the Instant Pot using the foil sling and let the cake cool in the pan before dusting it with powdered sugar. Thank u for the recipe, Can I replace baking soda with baking powder? If you have a recipe calling for baking soda, you might be able to substitute baking powder. However, you will need up to 4x as much baking powder to get the same amount of leavening. And, depending on the recipe, you might end up with a baked good that’s a little bitter with that much baking powder. You can sub baking soda for baking powder only if you increase the amount of acid in the recipe– which likely changes the taste and texture of your baked good. You are welcome, Chaitra. Thanks for the comment – meant a lot to me!